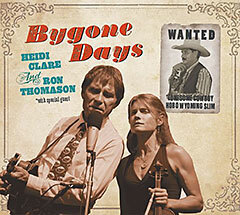 Bygone Days - Just Released! This is the old time music that your great-grandparents were steeped in—if and only if your great-grandparents happened to live in rural Appalachia before, during, and/or shortly after the Great Depression. Some of the songs are that old, and some are older. But some are newer too. It is the age of the spirit and the tones of this music that identify it. This is not and never was “radio music.” This is the music that those who tilled, milked, dug, graded, carried, and built by hand played in their minds as they did those things and enjoyed, performed, danced to, and expressed their deepest feelings with in the sparse moments not filled with the labor of surviving. Music like this has been preserved by folks like Fiddlin’ John; Curly Ray; Rose; Doc, Clint, and Fred; Maybelle; the early Cookes; the raucous Skillet Lickers; and others of their ilk. And Heidi Clare. I love playing music with Heidi because I’m from that culture, that place, and those folks. Bluegrass music has tended to “outgrow that region”, but this music has not. It’s rough and primitive, and it’s the kind that makes those who remember a grandmother who sang while she worked or a great-uncle who strummed a little with calloused hands, an open heart, and fatigue written all over his frame feel good about what those folks taught them through example. The energy is real; it’s not manufactured—so are the tears and the joy. Not for the casual listener. Purchase CDs securely using a credit card through CCNOW.